Max Holloway and Dustin Poirier are set to clash for the interim lightweight title in the headliner of UFC 236 on April 13 in Atlanta, as first reported by Brett Okamoto on ESPN.com. Holloway will retain his featherweight belt regardless of the result. Israel Adesanya vs. Kelvin Gastelum will serve as the co-main event; it will be the first UFC card headlined by two interim title fights. The clash comes as current lightweight champion Khabib Nurmagomedov has opted to sit out until November. He is currently suspended for inciting a brawl after his UFC 229 victory over Conor McGregor, but could have returned by April- a six-month suspension- if he had filmed an anti-bullying message in Nevada. The odd man out in this contest is Tony Ferguson. Holloway-Ferguson was reportedly considered, but the UFC ultimately ended up with Holloway-Poirier. Ferguson posted recently about being offered a bout, but said he wasn’t sure it was up to the standards he deserved for the work he had put in. Perhaps having won the interim title previously, and having it promptly stripped after a freak accident tore his knee, soured him on interim titles. It isn’t clear how the title picture will work after this. Will the interim champion defend their belt, or wait seven months to unify it against Khabib? Where will that leave Tony Ferguson? Will Conor McGregor re-emerge to affect those plans at all? Either way, the fight between Max and Dustin itself is incredibly compelling. Poirier defeated Holloway in Max’s Octagon debut in 2012, taking him to the mat and tapping him in the first round. 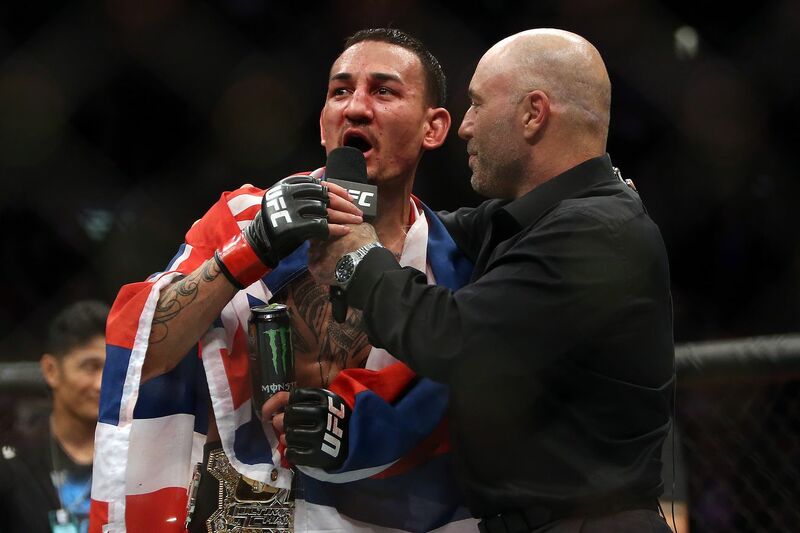 Since then, Holloway has gone on a 13-fight tear to win and defend featherweight gold. Poirier, who moved to lightweight after a knockout loss to Conor McGregor, has won 8 of his last 10 bouts, including wins over Eddie Alvarez, Justin Gathje, and Anthony Pettis. Who has the edge in the contest? Both fighters seem incapable of having a boring fight. Since beating Jose Aldo, Holloway has stepped up the pace and the pressure into a ‘Mad Max’ version of his style, racking up an unbelievable 290 strikes to set a new UFC record against Brian Ortega at UFC 231. Poirier is no slouch in that department himself, landing 174 strikes to stop Justin Gaethje in the 4th-most prolific win in UFC history. Holloway recently posted about his first encounter with Poirier while paying tribute to Georges St. Pierre’s retirement. This was a graceful knockout; Petchdam glided across the ring to land that one-two. The announcement that Valentina Shevchenko and Sijara Eubanks would headline UFC 230 came as a surprise to the MMA community, especially considering some of the other available options. A bantamweight No. 1 contender clash pitting Erik Perez against John Castaneda will headline Combate Americas “Mexico vs. USA” on Oct. 13. The Ultimate Fighting Championship heads back down under in December for a Fight Night event in Adelaide. It will be the second time in three years the UFC has visited South Australia. It seems the main event for the card is set, with Australia’s own rising heavyweight Tai Tuivasa to take on the former heavyweight champion Junior dos Santos. Darrion Caldwell-Noad Lahat Non-Title Bout to Headline Bellator 204 in Sioux Falls, S.D. A featherweight, non-title bout pitting Darrion Caldwell against Noad Lahat will headline Bellator 204, as the promotion makes its first visit to Sioux Falls, S.D., on Aug. 17. A heavyweight clash pitting Fabricio Werdum against Alexey Oleynik has been targeted to headline the Ultimate Fighting Championship’s first-ever card in Russia on Sept. 15.